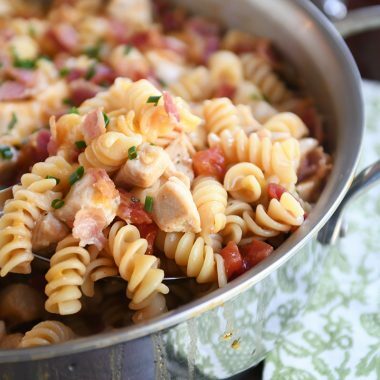 There is so much to love about this one-pot Monterey BBQ chicken pasta! It is simple, fast, and out of this world delicious! If one-pot wonders get you as excited as they get me, you are going to love this recipe. 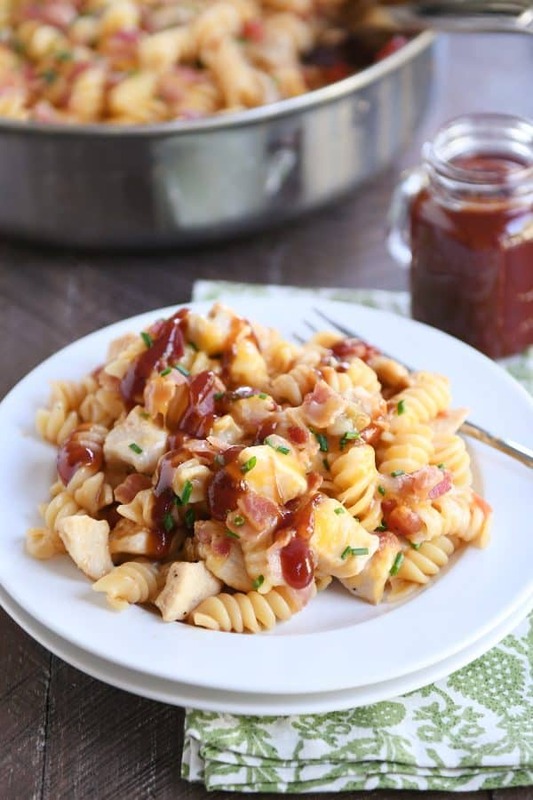 Made start to finish in a pot (or deep skillet), this Monterey BBQ chicken pasta is loaded with a million of my favorite flavors. 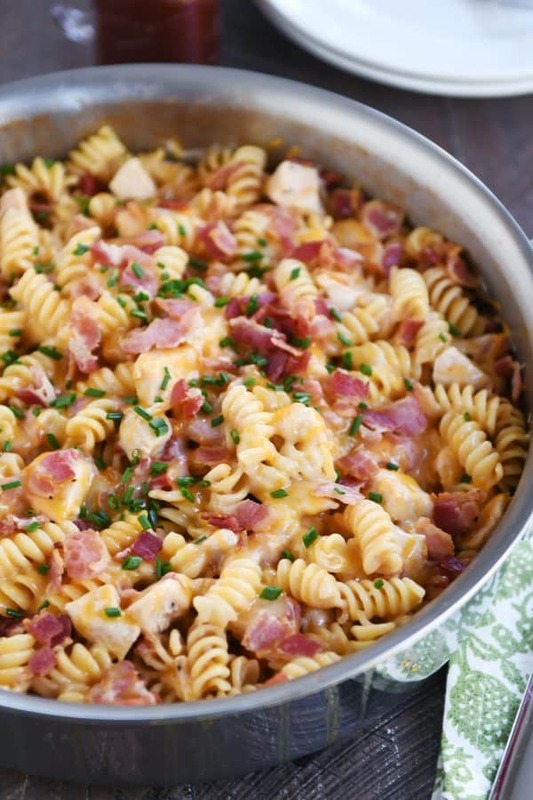 Tender chicken and bacon. Tangy BBQ sauce and melty cheese. Juicy tomatoes and hearty pasta. Do you see what I mean? There’s so much to love here. 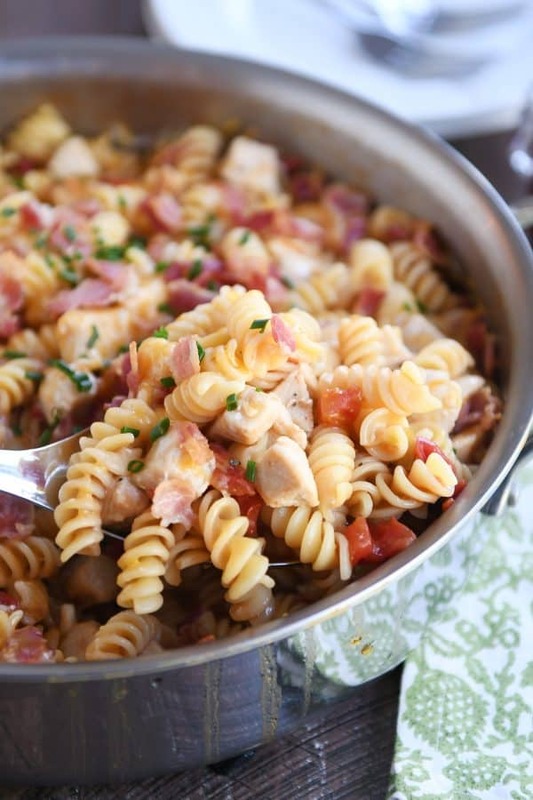 It reminds me a little bit of this old recipe for BBQ chicken pasta that’s been on my site forever. 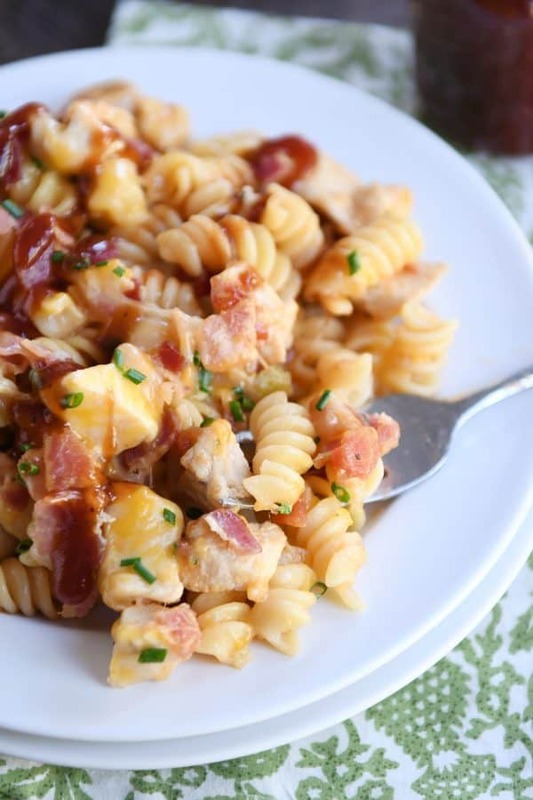 But in terms of overall flavor and delicious wow factor, this Monterey BBQ chicken pasta version is the winner. My family requested this go on the regular meal rotation ASAP. Until I gently reminded them that we don’t really have a regular meal rotation around here. Largely because they have a mother who is obsessed with trying new recipes and the idea of eating the same thing over and over makes her want to cry. Poor kids. Sometimes I can tell the new recipes for dinner streak (not all of them home runs, I’m afraid) has gone on too long. The bleak, wary look in their eyes lets me know it better be a spaghetti night. But I did agree with them that the deliciousness of this one-pot pasta was pretty high up on even my “meals to love” list and promised we’d see it again soon. Really, it might be one of my top favorite pasta recipes. The flavors just speak to me! If you love this grilled Monterey chicken recipe (oh my gosh, so good), I think this pasta version, although slightly different thanks to the BBQ sauce and a few other flavors, is going to become a fast favorite. I’m heading out of town for the next 10 days, and so it will be a little quiet around here (thanks for your patience in advance as I won’t be checking in much, but my trusty virtual assistant, Emily, will be answering comments for me and tackling any issues while I’m gone). I was feeling kind of guilty about leaving for so long (especially since I’ll be lazing around on my first-ever cruise – to Alaska! ), until I realized this was the recipe I was leaving you with. It’s worthy of being abandoned for a week. Make it and report back! I can’t wait to hear what you think! In a 12-inch deep skillet (at least 2 to 3 inch sides) or a 5- or 6-quart pot, heat the oil over medium heat until shimmering. Pat the chicken pieces dry and season lightly with salt and pepper. Add them to the pot in a single layer and cook until golden and cooked through, stirring occasionally. Remove to a plate and set aside. Add the chopped bacon to the pot and cook until crisp. Drain any excess grease and scrape the bacon onto the same plate as the chicken. Keeping the pot over medium heat, add the broth, deglazing the pan and scraping up any browned bits with a cooking spoon or spatula. Add the rotel tomatoes, pasta and salt. Stir to combine. Bring the mixture to a simmer and cook, uncovered, stirring often and moderating the heat to prevent sticking, until the pasta is al dente (about 10-12 minutes, but check package instructions as each brand may vary). Stir in the BBQ sauce, cooked chicken and bacon and heat through. Sprinkle the cheese over the top, cover, and let the pasta rest off the heat until the cheese is melted, 2-3 minutes. Garnish with chives or green onions and serve warm, drizzling with extra BBQ sauce, if desired.